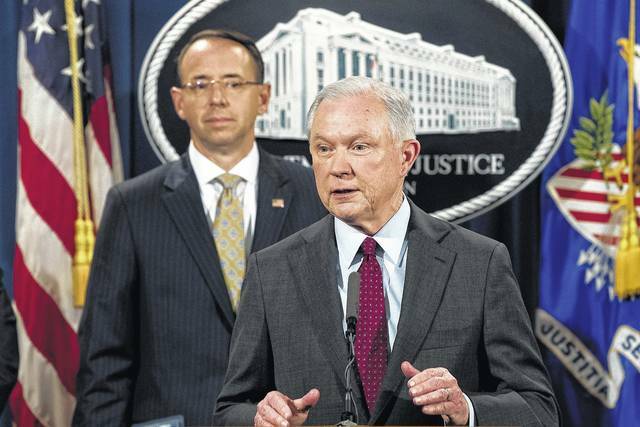 Attorney General Jeff Sessions accompanied by Deputy Attorney General Rod Rosenstein, left, speaks at a news conference to announce an international cybercrime enforcement action at the Department of Justice, Thursday, July 20, 2017, in Washington. WASHINGTON (AP) — Attorney General Jeff Sessions, publicly skewered by his boss for stepping clear of the Russia-Trump investigations, declared Thursday he still loves his job and plans to stay on. Yet Donald Trump’s airing of his long-simmering frustrations with Sessions raised significant new questions about the future of the nation’s top prosecutor. The White House was quick to insist that the president “has confidence” in Sessions. However, the episode underscored how the attorney general’s crime-fighting agenda is being overshadowed by his fractured relationship with Trump and the continuing investigations into allegations of Russian ties to the Republican candidate’s presidential campaign. The challenges for Sessions were laid bare Thursday when the attorney general, at a Justice Department news conference to announce the takedown of a mammoth internet drug marketplace, faced zero questions about that case and was instead grilled on his reaction to being excoriated by Trump in a New York Times interview a day earlier. The news conference on the drug case was quickly ended once it was clear reporters would only ask about the interview. Sessions did not directly address his relationship to Trump except to say he was still carrying out the agenda of the president. It all followed Trump’s statements to the Times that he never would have tapped the former Alabama senator for the job had he known a recusal was coming. Sessions took himself off the Justice Department-led case in March following revelations he’d failed to disclose his own meetings with the Russian ambassador to the U.S. That placed the investigation with his deputy, Rod Rosenstein, who in May appointed former FBI Director Robert Mueller to serve as special counsel. Several people close to Trump — including his eldest son, Donald Trump Jr, who has also been ensnared in the Russia probe — have told the president that they, too, believe Sessions’ decision to recuse himself was a mistake, according to three White House and outside advisers who spoke on condition of anonymity to discuss private conversations. In the same Wednesday interview, Trump lashed out at Mueller, Rosenstein, James Comey, the FBI director Trump fired, and acting FBI Director Andrew McCabe, who replaced Comey. The broadside against Sessions in the interview was not a calculated ploy to force the attorney general to resign but rather Trump’s frustration with his longtime ally bubbling to the surface, the advisers said. For weeks, the president has seethed about Sessions’ decision to recuse himself from the federal investigations into whether Trump’s campaign coordinated with Russia during last year’s election — Probes that have shadowed the administration from the outset. That others agree Sessions’ recusal was a mistake has only fueled Trump’s frustration with the investigation dogging the White House. Despite his protests to the contrary, Trump continues to closely follow cable TV news coverage, and he frequently interrupts conversations about other topics to complain bitterly about the probe or, on occasion, predict that it will soon be behind him. The advisers said the president viewed Sessions’ move as an act of disloyalty — arguably the most grievous offense in the president’s mind — and was angry that Sessions did not consult with him ahead of time. Yet the frustration goes both ways. At the Justice Department, there’s displeasure that developments on Trump and Russia routinely drown out work that officials are trying to highlight. Much like Thursday, a May rollout of a sentencing policy shift was overshadowed by Trump’s firing of Comey that same week. At one point, Sessions privately told Trump he was willing to resign his post, but the president did not accept the offer. And Sessions has given no public hints that he plans to leave, traveling the country for speeches to outline a tough-on-crime approach to violence and immigration. He kept his scheduled appointments Thursday. “I’m totally confident that we can continue to run this office in an effective way,” he said. The first U.S. senator to endorse Trump during the presidential run, Sessions bonded with him over shared hard-line immigration views. Some of Sessions’ long-serving advisers are now working alongside the president in the West Wing. Defense attorney William Jeffress, who represented former President Richard Nixon, said he’s concerned that Trump’s rhetoric about Sessions reveals a larger misunderstanding of the attorney general’s role. “I really think that the president needs to understand and appreciate the independence of law enforcement,” Jeffress said, adding that the president is “just wrong” to look at the attorney general as someone responsible for protecting the Trump’s personal interest. A Sessions resignation could throw Mueller’s investigation into uncertainty. Trump would nominate a replacement and could seek assurances that his pick would not recuse himself from the investigations. Trump raised the prospect of firing Mueller in his interview with the Times, suggesting he had damaging information on the former FBI director. The president also said Mueller’s selection for the job was a conflict of interest because Trump had spoken with him about returning to the FBI after the firing of Comey. The president has repeatedly told those close to him that he fears there is a movement underway, fueled in part by Comey, Rosenstein and potentially Mueller, to discredit his presidency. He has denied that his campaign had any contacts with Russia during the election, though that assertion has been challenged by his son’s acknowledgment that he accepted a meeting that was billed as part of the Russian government’s efforts to tar Democrat Hillary Clinton. Associated Press writers Julie Pace, Sadie Gurman and Chad Day contributed to this report.